I’ve had the vision for this dress for a long time! I’ve been obsessed with finding myself some form of shirtdress/tunic that I could wear with leggings and boots. I just love seeing that look on other people and wanted to replicate it. Unfortunately I have not been able to find one that fit me quite right at any store. Fortunately for me I know how to sew ;). Once I successfully made the Archer shirt (blogged here), I knew that I wanted to try to modify it to be a shirtdress. Jen did actually just come out with a sleeveless shirtdress pattern- the Alder, but I’m trying not to buy more patterns right now, and I wanted a long sleeve version so I could wear it all winter. I searched and searched the internets for examples of other people modifying the Archer into a dress and just could not find anything! Which I thought was strange because it seems like something that has been done already. But maybe it’s just that me who’s been obsessing about this style, and no one else cares about it. Lol. I decided to be a good sew-er (really, what am I supposed to call myself? I never can come up with a word that sounds right) this time around and actually make a muslin- I know, don’t die from the shock of it! I’m just too lazy to make muslins normally but I wanted this dress to be perfect. I used some quilting cotton and cut out the main bodice and sleeves. 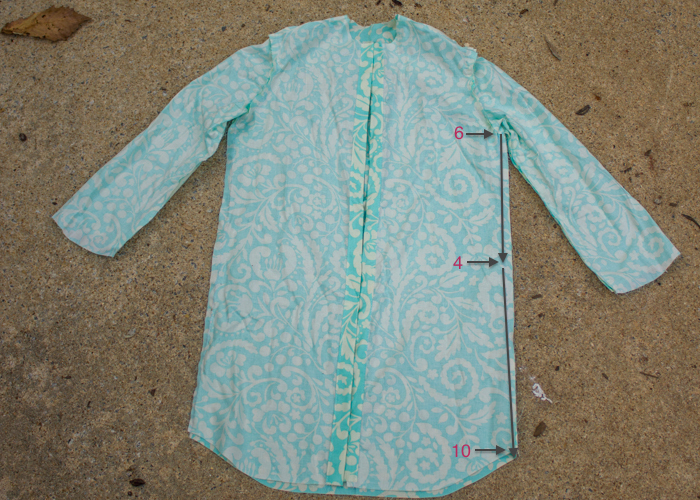 I added 9″ to the original shirt hem to make it more dress/tunic length. Since my last shirt was a little big, I cut out a smaller size this time- a 6- to begin. I basted everything together and tried it on for size. It fit ok but looked a little paper bag-ish. I decided to take in the waist a little and let out the bottom a bit to give the dress more of a figure. I kept the top at the size 6, marked a 4 on the pattern line at the waist, a 10 at the bottom of the dress and then drew a straight line connecting each of these marks. I included a picture of my muslin here for example (I just figured out how to annotate my pictures- happy dance!). This little change ended up making the dress fit perfectly. 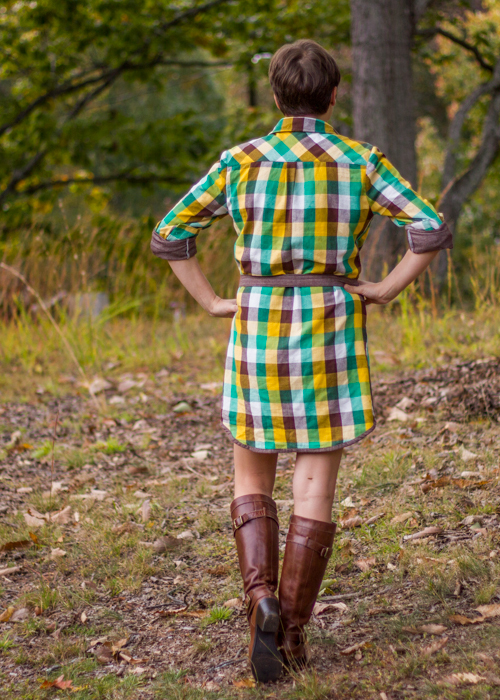 The fabric is this amazing double cloth plaid from imagine gnats. I had been coveting it since she posted it on her IG account, and then when she decided to have a 20% off sale over the weekend, I was lost. Had to get myself some of it! Similar to the double gauze from my last archer, double cloth is not the easiest fabric to sew with. Because it’s actually two fabrics tacked together, you have to be really careful cutting it out and sewing it together- the layers tend to be shifty. This one especially takes lots of patience, but is totally worth the effort. My tips for smoother and stress-free sewing: use your walking foot, lengthen your stitch, and sew slowly. I realize this is a little fuzzy- it’s the only decent shot I got of the full dress with the belt. I cut the back yoke and pockets on the bias- for effect and so I didn’t have to worry about lining up any plaids on the back. ;). I used Jen’s alternate pocket tutorial with two changes- I cut 1/2″ off the bottom hem for a smaller pocket and folded the seams over to the right side to show off the brown side of the fabric. I’m not that great at lining up plaids- seems like the more I try, the worse I do! I’m super happy that I at least managed to line them up across the button placket. I also added some sleeve tabs. I am a perpetual sleeve-roller-upper, and I thought these would add a fun touch. I used one of Ian’s shirts as an example of how to make them since I had never made them before. They ended up a wee bit too far forward but not enough to make me want to redo them! I also rolled up the hem the wrong way to give a little contrast of the brown at the bottom. In the middle of making this, I got worried that all this plaid would be too much but I think the little brown accents are the perfect touch to tone it down. The belt is just the double cloth folded over on itself and sewn up on all sides. I like the dress both with and without the belt and think I will switch it up based on my mood. I’ve already worn this dress several times in the week since I’ve finished it and I think it’s going to be the perfect fall piece. 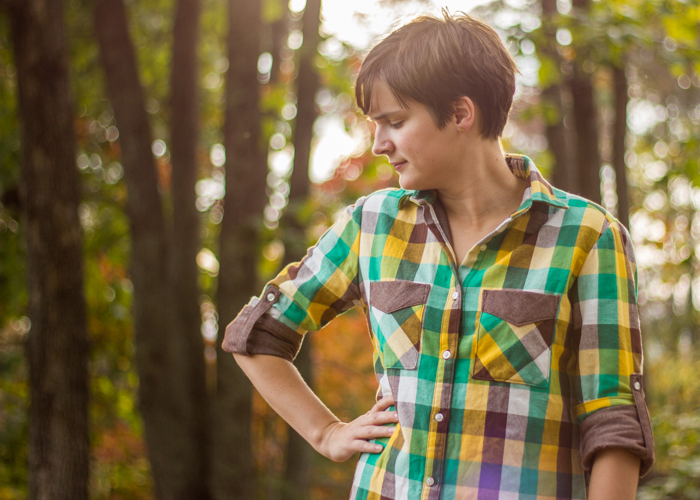 In fact, I already have a chambray version planned out in my head! It’s going to be the season of the archers and archer variations this fall! 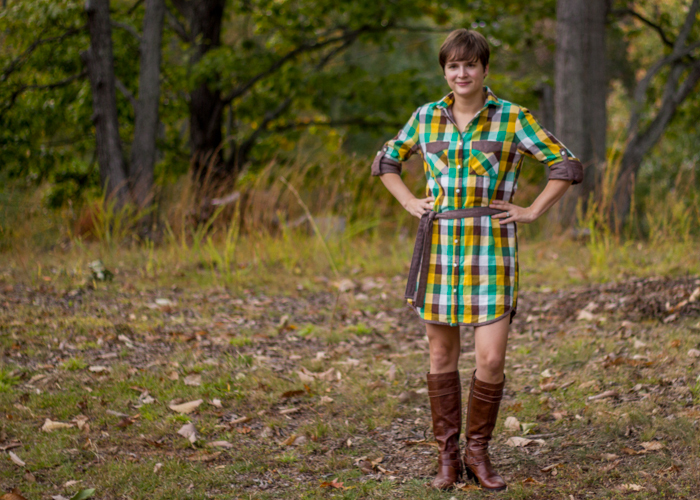 This entry was posted in Selfish Sewing and tagged archer shirt, fall wardrobe, grainline studios, shirtdress tutorial by oliver's fancy. Bookmark the permalink. so cute on you!! love the thoughtful details and how you worked with the plaid/double cloth. 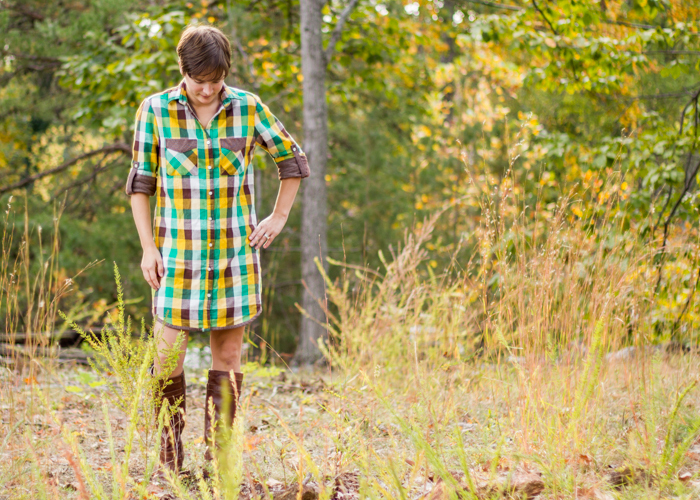 looks like the perfect fall dress. Thanks! It really is perfect for our fall and so easy to dress up or down. Im seeing several of these plus some regualr archers being my fall wardrobe! this dress is just so so perfect! It look amazing on you and I love the details and fabric choice is perfect!